Download "COURSE SYLLABUS. 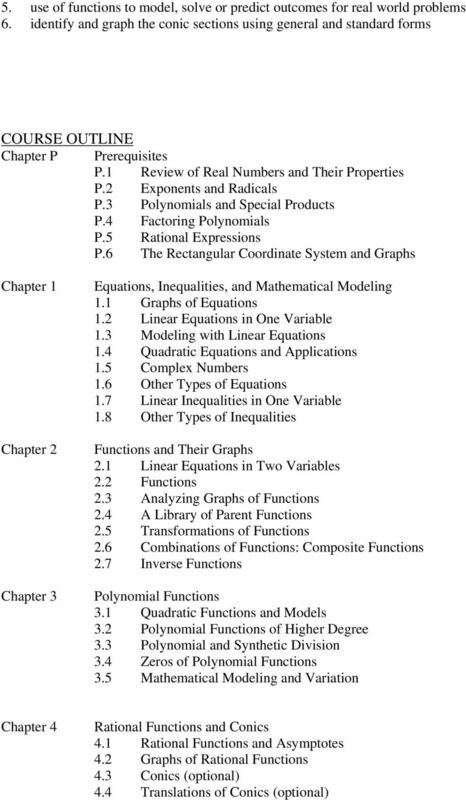 TEXTS *The official list of textbooks and materials for this course are found on Inside NC." 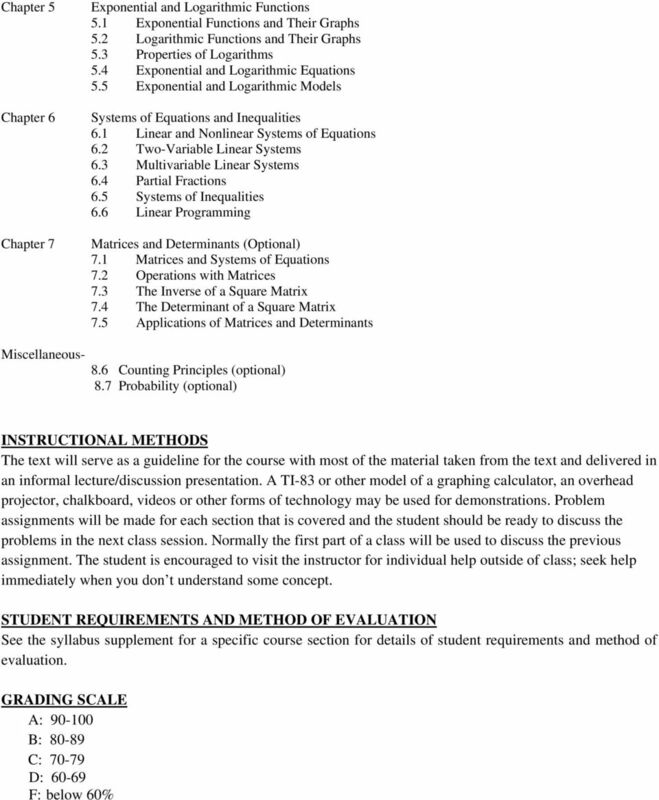 4 See the syllabus supplement for a specific course section for details of grading scale. 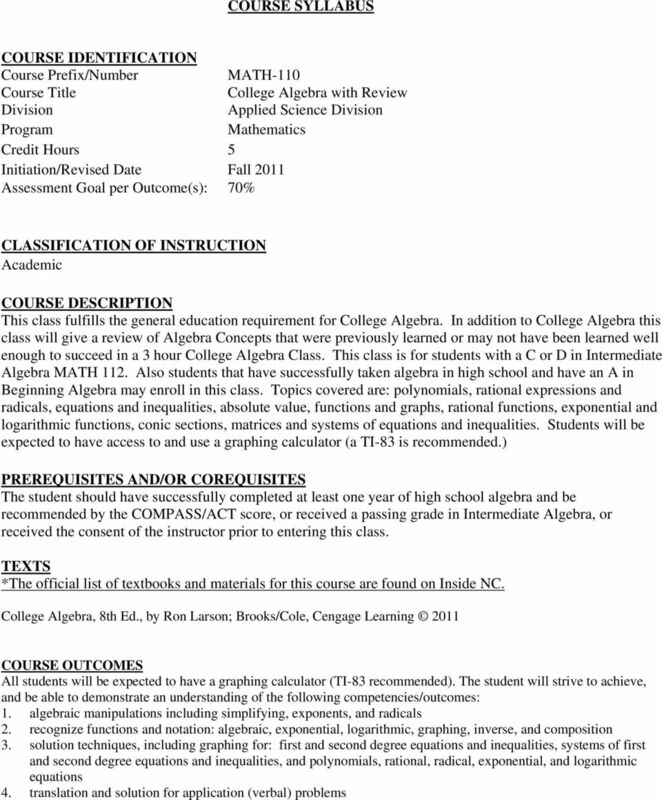 A random selection of students enrolled in College Algebra with Review courses will be required to successfully complete a standardized testing by the end of the semester. A schedule of possible exam dates and times will be provided by your instructor. Failure to successfully complete the exam will result in a withhold of grades. ASSESSMENT OF STUDENT GAIN In order to assess course effectiveness an appropriate Placement Examination will be administered as both a pre- and posttest (per institutional assessment plan). This will give a measure of the effectiveness of our own institutional placement procedures as well as an indication that the necessary advancement in student abilities has occurred so that the student may enroll in Calculus. ATTENDANCE POLICY Absences that occur due to students participating in official college activities are excused except in those cases where outside bodies, such as the State Board of Nursing, have requirements for minimum class minutes for each student. Students who are excused will be given reasonable opportunity to make up any missed work or receive substitute assignments from the instructor and should not be penalized for the absence. Proper procedure should be followed in notifying faculty in advance of the student s planned participation in the event. Ultimately it is the student s responsibility to notify the instructor in advance of the planned absence. Unless students are participating in a school activity or are excused by the instructor, they are expected to attend class. If a student s absences exceed one-hundred (100) minutes per credit hour for the course or, in the case of on-line or other non-traditional courses, the student is inactive for one-eighth of the total course duration, the instructor has the right, but is not required, to withdraw a student from the course. Once the student has been dropped for excessive absences, the registrar s office will send a letter to the student, stating that he or she has been dropped. A student may petition the chief academic officer for reinstatement by submitting a letter stating valid reasons for the absences within one week of the registrar s notification. If the student is reinstated into the class, the instructor and the registrar will be notified. Any combination of three late arrivals to class and/or early departure from class before the conclusion of the session may count as one absence. ACADEMIC INTEGRITY NCCC expects every student to demonstrate ethical behavior with regard to academic pursuits. Academic integrity in coursework is a specific requirement. Definitions, examples, and possible consequences for violations of Academic Integrity, as well as the appeals process, can be found in the College Catalog, Student Handbook, and/or Code of Student Conduct and Discipline. CELL PHONE POLICY Student cell phones and pagers must be turned off during class times. Faculty may approve an exception for special circumstances. 5 CLASSROOM ENVIRONMENT Students are encouraged to participate freely in classroom discussions, including offering personal insights and asking questions relevant to the subject at hand. However, intentionally non-relevant comments and questions, and personal conversations are disruptive and are not appropriate in coursework while class is in session. These behaviors interfere with the learning process and therefore will not be tolerated. You are expected to conduct yourselves at all times as mature adults actively engaged in the pursuit of higher learning. 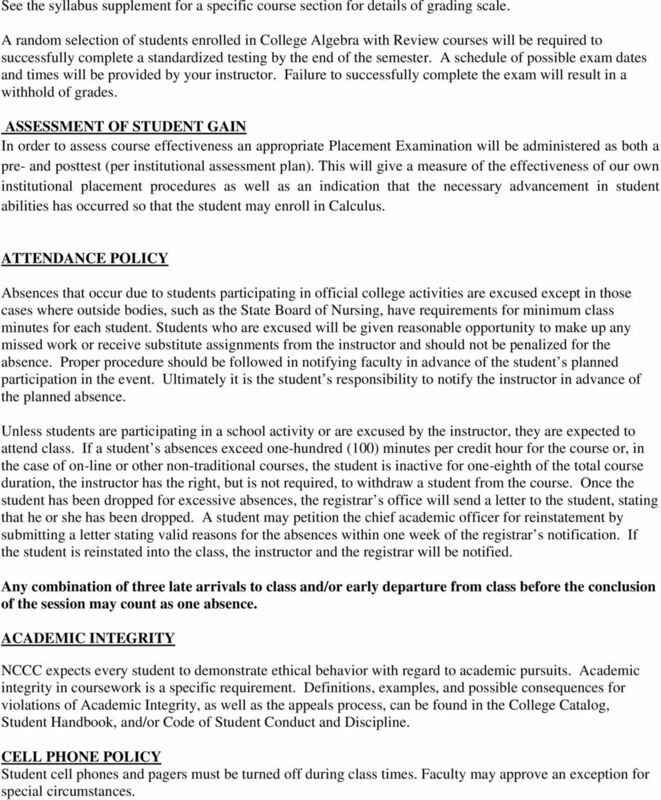 Notes: Information and statements in this document are subject to change at the discretion of NCCC. Changes will be published in writing and made available to students. 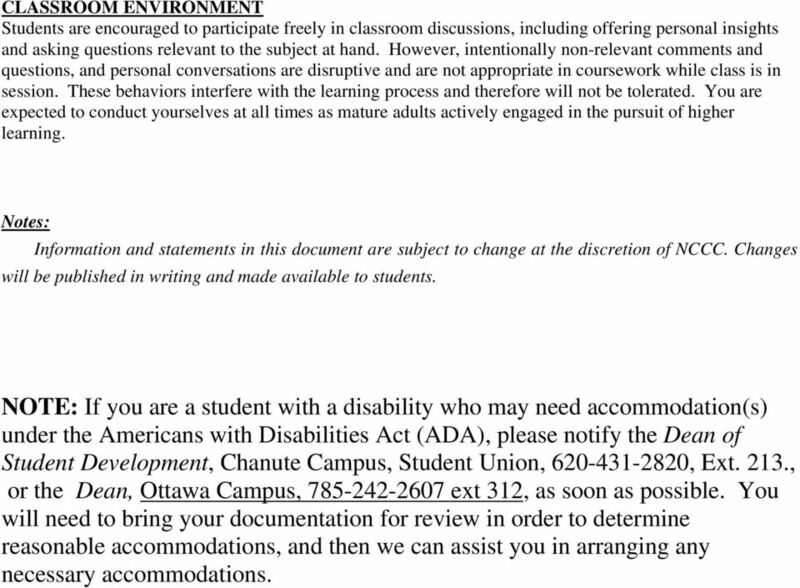 NOTE: If you are a student with a disability who may need accommodation(s) under the Americans with Disabilities Act (ADA), please notify the Dean of Student Development, Chanute Campus, Student Union, , Ext. 213., or the Dean, Ottawa Campus, ext 312, as soon as possible. You will need to bring your documentation for review in order to determine reasonable accommodations, and then we can assist you in arranging any necessary accommodations. * The official list of textbooks and materials for this course are found on Inside NC.